Trust no one! That is the message of Oleanna. Well, there are actually quite a lot of messages packed into David Mamet’s two-character drama, but that’s certainly the theme that I left the theater with. 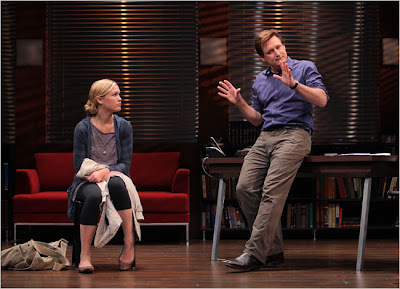 Bill Pullman and Julia Stiles box star in this revival of Mamet’s 80-minute drama about a college professor and student embroiled in a high-stakes battle of words. But trust me; it’s uglier than it sounds. Is the college professor (Pullman) sexist? Is the student (Stiles) over sensitive? Has he made an attempt to diminish her? Or is she just out for blood? None of these questions can be answered definitively, which is frustrating. But half the fun is considering all arguments in your head when the play is over. What’s frightening about Oleanna is that it’s setting is based on an occurrence we can all relate to: seeking extra help from a teacher. It’s innocent enough—a student is trying to learn and the teacher is willing to aid the process; no one expects, well… the furniture to be turned upside down. Oleanna presents this common scenario in nightmare form: the student feeling harassed and the teacher having his career and personal life about to be shattered. Oleanna starts off at a slow, ‘Where-is-this-going?’ pace. But have patience. What you’re watching is an invisible puzzle being put together, and at any moment, the image will pop more vividly that you could have imagined. And that’s one aspect that makes this play fascinating (and probably worth a second viewing). Every statement and gesture is placed in the scene for a reason. Mamet’s clues and nuances each come into play later in the story, and mock your expectations that they were mere excess. Stiles is wonderful as Carol, the student. Every emotion that brushes past Carol’s face appears genuine, until Stiles purposely makes you question it. Her performance kept me guessing the entire time, and it made me delightfully awestruck. Her stubbornness and matter-of-fact diction is so on key, it could make anyone’s blood boil. Pullman gives college professor John a painful weariness—I felt stressed just watching him. He brilliantly illustrates strained phone conversations and allows characters that aren’t even on stage to get the best of his. Pullman makes John’s eagerness to reach out to Carol earnest and heartbreaking, particularly in the light of the damning accusations she’s brought against him. The stages of Oleanna are built in a marvelous crescendo. My interest grew appropriately as the stakes rose in each scene, so that by the conclusion, I was wide-eyed and waiting for an answer. And what a finale! At the risk of revealing any surprises, I’ll spare details. 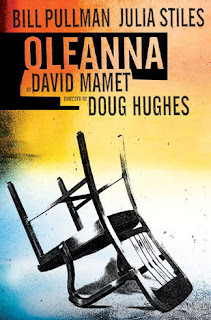 But the closing of Oleanna is one of the most shocking and nail-biting pieces of theater I’ve ever seen. I don’t think I’ve ever felt so uncomfortable in a theater before. I was amazed at Pullman and Stiles’ ability to do the scene so well and couldn’t help but wonder how awkward it must be for them to execute. While these characters spend the entire play explaining themselves and attempting to justify, they still feel like a mystery at the play’s end. I don’t know their motives or how they came to be the way they are. Perhaps Mamet wants these characters to almost be phantoms, but I felt like I needed to know them better in order to truly understand them. Regardless of your beliefs or whose side you end up taking, what’s tragic about Oleanna is that two people had an opportunity to reach out to each other and help, but decided to sucker punch the other instead. And because of that, I say, trust no one! Editor’s note: I was invited to see Oleanna and did not rush it. There is a student rush policy in place for this show. Tickets go on sale one hour prior to curtain for $20 each, up to two tickets per ID. And in case you can’t rush the show, but still want to get a discount, Stage Rush is offering its first discount offer! To save over 40 percent on tickets, visit BroadwayOffers.com and enter code OLMKT93. Tickets are only $59 Tuesday-Friday or $65 Saturday and Sunday. Valid through November 15.